Star Wars: The Clone Wars "The Lost Missions" and the rest of the Clone Wars saga will debut on Netflix on March 7th at 12:01 am PST. This week a few preview clips have been released thus far. Yesterday, the Star Wars YouTube officially released the Yoda clip that was first seen last May at Star Wars Weekends at Disney World. This video is embedded below. Star Wars: The Clone Wars - The Lost Missions - "Voices"
Today, USA Today released another clip from The Lost Missions in the post, "Exclusive clip: Clones come to Kamino in 'Star Wars: The Clone Wars'". 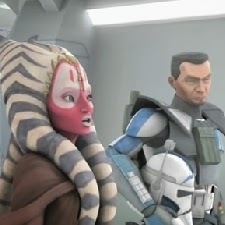 This new clip features Captain Rex, Fives and Shaak Ti on Kamino as the investigation continues into why Tups killed the Jedi as seen in the first "bonus content" trailer from March 11, 2013.